RESPONSE, one of the UK’s leading contact centres located in Glasgow, has staged its third annual awards ceremony in recognition of the hard work its employees have delivered over the last year. 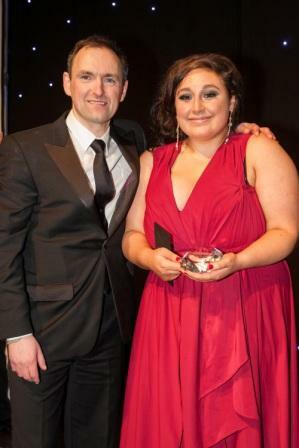 14 awards in total were up for grabs at the ‘Glitzies’ event in Glasgow’s Crowne Plaza hotel; with leading TV and Radio personality Tam Cowan appearing as special guest host for the event. Employees were nominated from all across the business; with their dedication, professionalism and exceptional performance highlighted as key factors in the success of the business over the last 12 months. Two of the evening’s most anticipated awards; the Advisor of the Year and Employee of the Year went to Jemma Barclay and Nadia Ness respectively. Senior Customer Excellence Co-Ordinator, Nadia Ness went home with this top award due to her ongoing pursuit of customer excellence and by consistently going above and beyond to deliver the highest standard of support in every aspect of her role. Photo Caption: Brian Bannatyne (Managing Director) and Nadia Ness (Employee of the Year) – Jemma Barclay, picked up the Advisor of the Year award for the determination, dedication and drive she has demonstrated since joining the company in October 2012, and is described as “truly living and breathing the RESPONSE values, instilling these in the people around her”. Brian Bannatyne, Managing Director for RESPONSE said: “The Glitzies is an opportunity for us to commend the sterling efforts of our people over the course last year and we congratulate all of our winners who are a true asset to the company. Be the first to comment on "RESPONSE Staff at the ‘Glitzies’"